The saying “two is one, one is none” is common in military and survival circles, and for good reason. 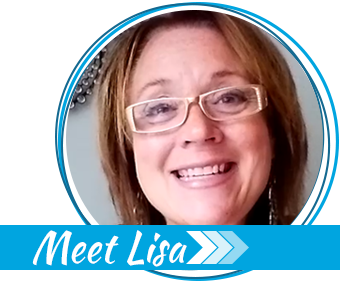 The principle is especially true when considering water purification, as most people can function effectively for weeks with little food while they require water in greater and more frequent quantities. 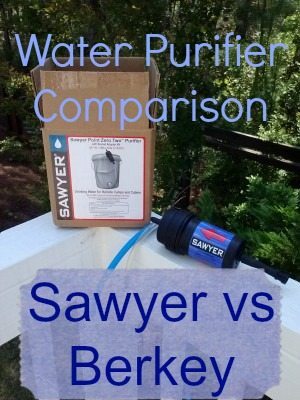 Today’s water purifier comparison includes two filters that are appropriate for the home or car. They are a bit large for normal backpack carry, though they could be hand carried for some distance if necessary. The Sawyer Point ZeroTWO uses gravity to purify water. 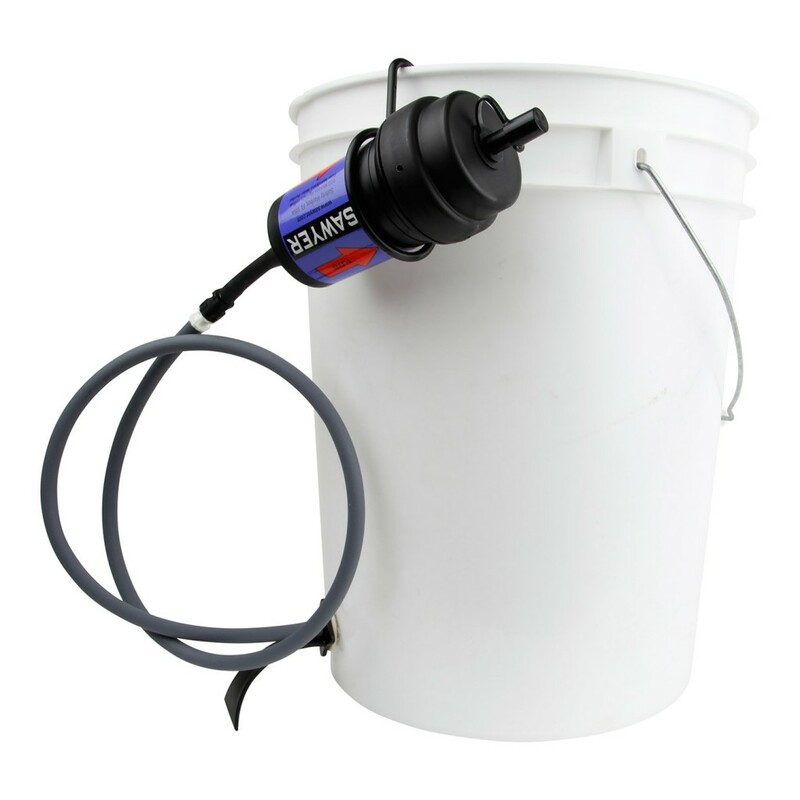 Users need only fill the five-gallon bucket with collected water, then unhook the filter from the bucket and hold it above a second container. The bucket of “dirty” water will obviously need to be placed on a shelf, or, in the wilderness, attached to a tree or improvised platform to allow gravity to do its work. Berkey’s counter-top filters, like the Big Berkey pictured here, are constructed of highly-polished stainless steel and come standard with two purifications elements. Two additional purification elements can be added (for just over $100.) 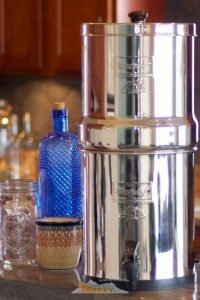 The basic two-filter Big Berkey costs around $250. It can filter 3.5-7 gallons of water per hour, depending on configuration, up to a total of 6,000 gallons. 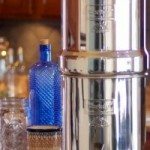 Berkey Systems are certainly more durable and powerful, with a price tag that reflects such. They are not easily transported by hand, and extra purification elements are necessary beyond 6,000 gallons of water filtered. 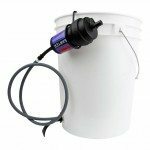 Sawyer’s Point ZeroTWO, like the Berkey, is a bit bulky to move by hand once attached to a bucket, and can filter 100,000 gallons. They are not as powerful, though the drinking water is clean and can sustain life. These filters are not as durable as the Berkeys, and will require gentle handling in a wilderness environment to avoid damaging them. They are not overly fragile, but survival living can be rugged and care should be taken. The Berkey filters do not need to be replaced after 6,000 gallons. You can use them again and again simply by cleaning them, and cleaning is easily accomplished with a non-abrasive cleaning pad and water. We love our Berkey. But neither of these deals with hard minerals. 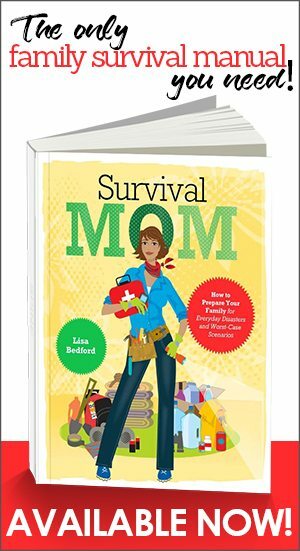 I will occasionally soak the spigot in vinegar to clean off the calcium deposits, rinse out the containers with vinegar & a little scrubbing, and it is possible to gently scrub the outside of the filters to remove the calcium. When we visited family in a city without hardwarter I was amazed at how much faster their Berkey filtered than mine, then realized it must be time for a clean out again. The other one sounds nice also. We tried the survival still but were not happy with it, so we will just keep on with the Berkey. Best wishes for clean water. Berkey’s are not allowed in California, but there is a simple solution. 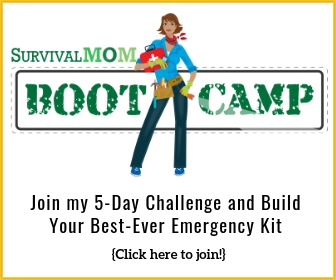 You can purchase the guts of the system from the “InternetPrepper”, they will ship to CA. Then simply install in a 2-bucket system. Video’s are available on You Tube. No, I am not affiliated with the company, nor have I done business with them. I’ve been using a Sawyer Mini, backpacking, through some very rough treatment and water conditions, and it has held up really, really well. When it clogs, usually because of sediment, the backwash procedure cleans it out and it is pretty much as good as new. I’ve taken to doing the backwash after every three days of use. It just takes a few minutes. 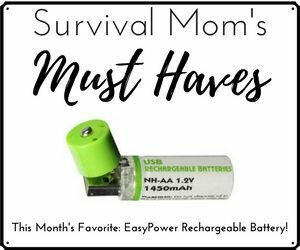 The Sawyer MINI does not have the flowthrough output that the PoinZeroTwo has, but wow… for $20, it just beats all competition. It is inexpensive enough to have one or two as backups. In the directions for the Sawyer Mini Water Filtration System it says not to use the unit if it freezes. I tried asking the company about this but received no response. Is this just when there is water in the filter, or even when it’s bone dry? Such a hangup could make this a worthless bit of equipment if a simple freeze disables it. Wouldn’t you say? But will either filter the microcystin algal bloom toxin? contaminates resulting from the current algae bloom.”…. We have hard water, iron, no smell. I was just wondering if the Berkey would be a good choice for us for everyday. The Berkey removes almost everything from water, including fluoride which most water filters don’t… I’m pretty sure iron would be no problem for it.